We are attempting to spray Metco 106F which is new for our company. The powder is a 96% Cr2O3 powder with 3% TiO2. The metallography is showing a globular dark phase which resembles oxide? 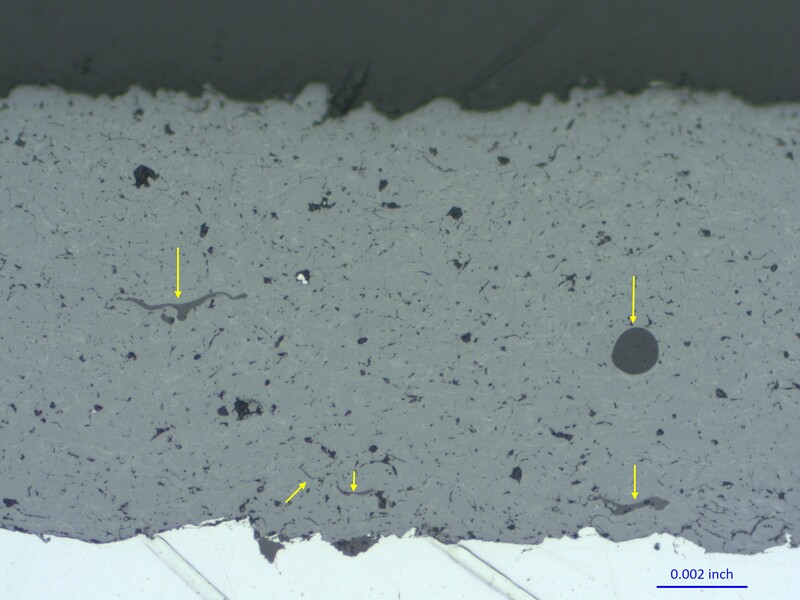 I cannot find any micrographs of what the metallography should look like and this darker phase comprises about 1% of the area. I'm trying to figure out if this is intrinsic to the coating or if it is some type of contaminant. I tried to insert my photomicrograph but cannot attach. Could someone please reply with a photo of a typical microstructure. Thank you! Finally got an image link. 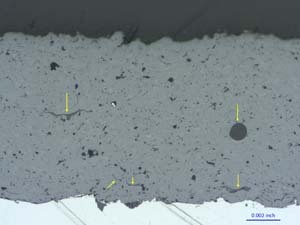 The dark areas are no different than water or alcohol, that remained on the cross-cut surface. These areas are transparent, you can see normal coating structure underneath. I think these odd inclusions are fairly typical for Metco 106F coatings and are just other oxide phases. No, they are not water or alcohol. They are melted and part of the coating structure. (09-14-2018 04:37 PM)Vadim Verlotski Wrote: The dark areas are no different than water or alcohol, that remained on the cross-cut surface. These areas are transparent, you can see normal coating structure underneath.